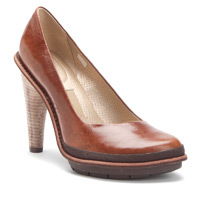 Tsubo Magda – Comfortable Heels for Certain Foot Types. Although the Tsubo Magda is not for every type of foot, this is a comfortable shoe for women who know that they can wear a shoe with a three inch heel height. The shoe gives you three and a half inches of height but the forefoot is one half inch thick. Second, it has a wedge type sole with a thick rigid sole that allows for more protection and comfort – particularly in the forefoot area. The inside of the shoe has added cushioning in the form of “latex foam padding and a forefoot compression platform” that allows for more comfort and protection of the forefoot. I personally love the Tsubo shoes and can wear the lower-heeled Tsubo’s all day. This, however, is a higher heel than might be comfortable for many women. The rule of thumb is – if you know that you can wear a three inch heel comfortably – this shoe should be an excellent shoe for you. If you know that you can’t tolerate heels this high, that means that your foot’s biomechanical structure is not suited for heels and I would not recommend these for you. It may sound simplistic but, when it comes to heels, women typically know how high they can go. The trick is to not learn that lesson the hard way! 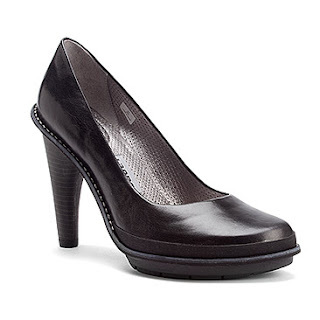 Overall, if you know that you can comfortably wear a three inch heel, this is a great choice! on a scale of zero to ten with ten being the best.